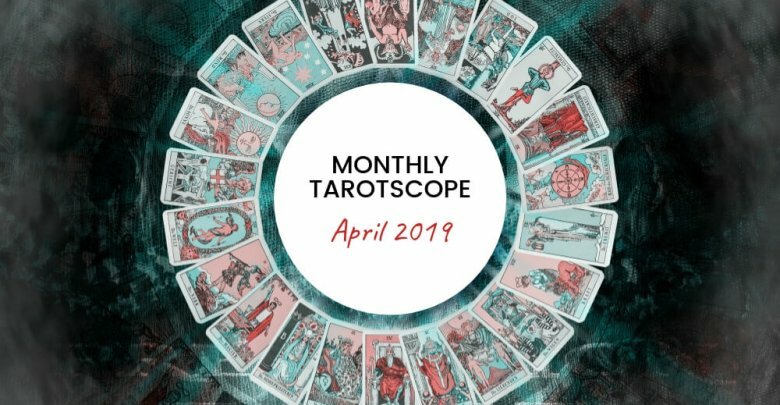 Welcome to the Tarotscope, a combination of Astrology and Tarot/Oracle Cards. Each month I will draw a card for each sign of the Zodiac. That card represents the meditation for the month for that Sun Sign. The Sun Sign represents your Primary Drive in life, how you best manifest your Life Path, and how the light of the Sun energizes you each day. This month I have chosen to use the Mythic Tarot Deck (original 1986 publication – out-of-print; reprinted and updated 2011). 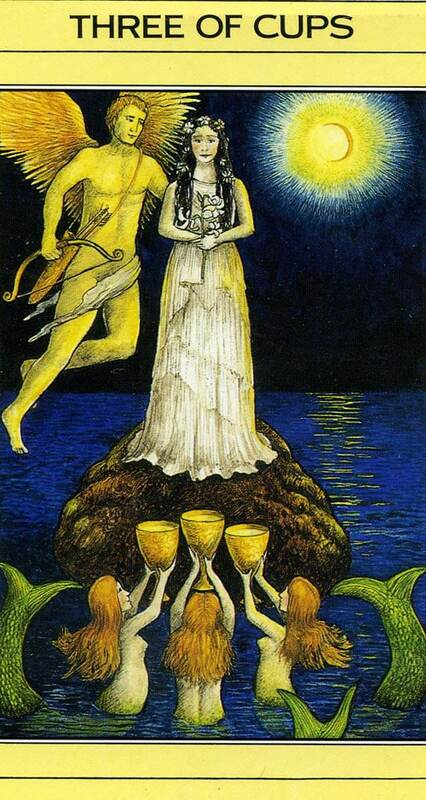 The card images for this tarotscope are from the 1986 version. Maverick Active Fire energy fuels your Primary Drive. Your Life Path energy operates best independently; you must learn self-discipline to manifest your best results. 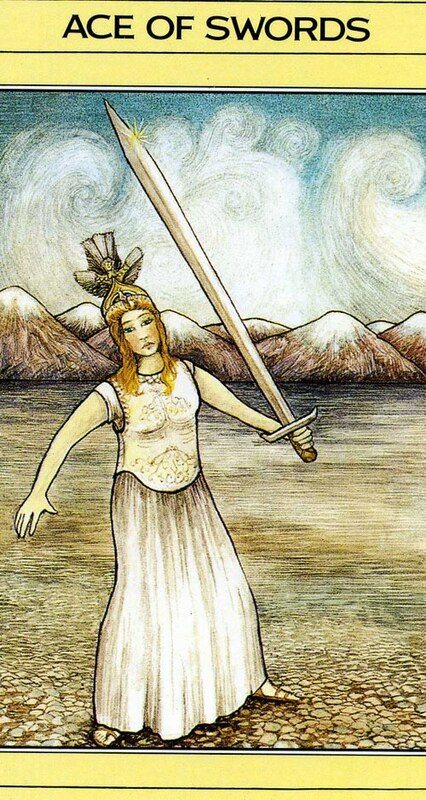 Your card this month is the 10 of Swords. The question to answer is, “What hardship has finally ended?” The action to consider taking: rest and recuperate. Orestes has been pursued by the Furies through the Swords suit and through his actions he helps change the rules of law from blood laws to civil laws. The change is reflected in the 10 swords separating Orestes from the Furies (old ways) while being watched over by Athena (new beliefs). Persistent Stable Earth energy fuels your Primary Drive. Your Life Path energy operates best when you feel secure; you must learn some degree of adaptability to manifest your best results. 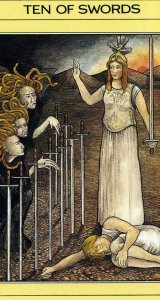 Your card this month is the 3 of Swords. The question to answer is, “Whose actions have brought me sorrow?” The action to consider taking: facing a difficult truth about others whose actions have brought you grief or harm. Orestes is not pictured; it is his father Agamemnon in the bath and his mother and her lover killing him. Orestes is now duty-bound to hunt his father’s killer, which is his mother. Curious Adaptable Air energy fuels your Primary Drive. Your Life Path energy operates best-doing tasks that stimulate your mind in a variety of ways; you must learn how to focus-on-demand to manifest your best results. Your card this month is the 4 of Pentacles. The question to answer is, “Where in my life do I need to make a change that I do not want to make?” The action to consider taking: find a way to move in the direction of the change or get left behind. 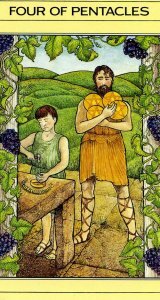 Daedalus is a master craftsman and is holding the 4 coins; his nephew is proving to be the next generation of artisan and is more talented than his uncle, and Daedalus fears to become obsolete. Nurturing Active Water fuels your Primary Drive. Your Life Path energy operates best when you care-take yourself and others properly; you must learn “emotional balance” to manifest your best results. 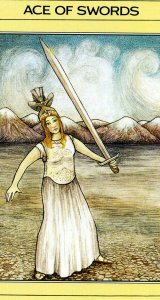 Your card this month is the Ace of Swords. The question to ask is, “What new thoughts or ideas do I need to embrace?” The action to consider taking: get started and then persevere; it is time to forge a new direction. Athena is pictured, ready for battle; fearless in the face of the unknown. Strong-burning Stable Fire fuels your Primary Drive. 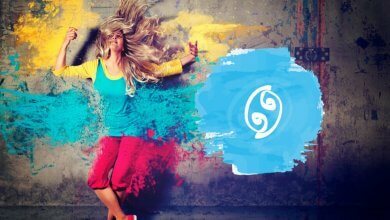 Your Life Path energy operates best when you are creative; you must learn structure to manifest your best results. Your card this month is the Hierophant. The question to ask is, “What knowledge do I master; what wisdom do I have to share?” The action to consider taking: teach others; show them the way through knowledge and the development of their skills at the hands of your expertise. Chiron, the wounded healer, represents this card. In his search for a cure for his ailment (poisoned and unable to die), he becomes the great healer who learns cures for all other illnesses. Practical Adaptable Earth fuels your Primary Drive. Your Life Path energy operates best when you get all the details in order; you must learn to “see the forest for the trees” to manifest your best results. 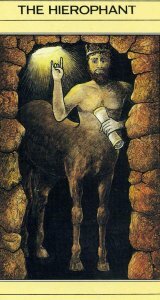 Your card this month is the 5 of Pentacles. 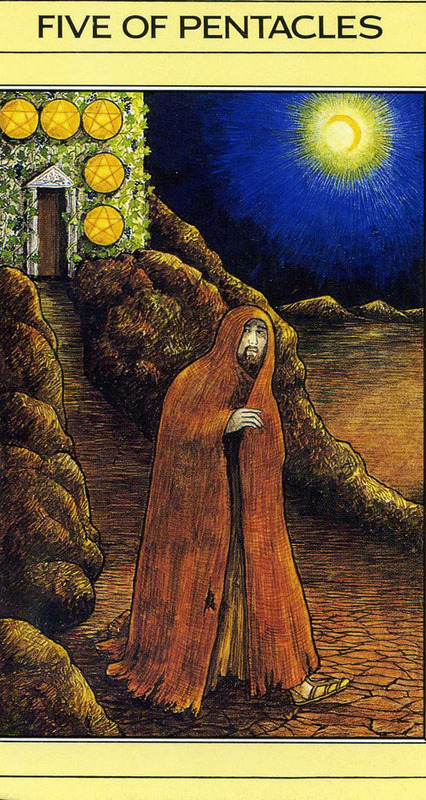 The question to ask is, “Where do I go now; how do I start over?” The action to consider taking: make a significant change in your life even if it requires “leaving under the cover of darkness.” Daedalus, motivated by jealousy and fear, kills his nephew and must flee his home and restart his life somewhere new and with no assurances of success. Analytical Active Air fuels your Primary Drive. Your Life Path energy operates best when acting logically; you must learn to mix in feelings to manifest your best results. 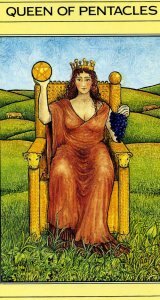 Your card this month is the Queen of Pentacles. 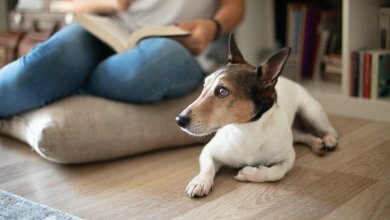 The question to ask is, “What do I need to feel safe and secure?” The action to consider taking: get your finances and material world in order; manage your important legal documents, organize your home, and make sure you are managing your life properly. 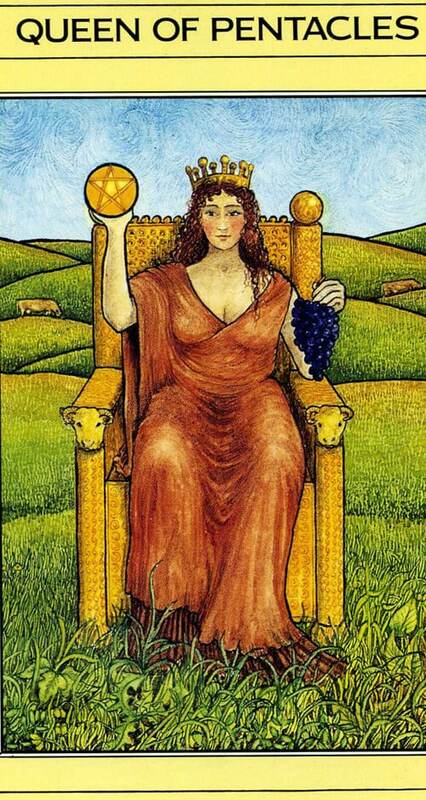 Queen Omphale sits on the throne, lover, wife, and mother of 3 sons to Heracles; she is a symbol of stability and earthly wealth. Intense Persistent Water energy fuels your Primary Drive. Your Life Path energy operates best when bringing or experiencing transformation; you must learn “playfulness or lightness of heart” to manifest your best results. 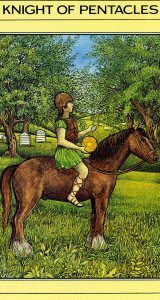 Your card this month is the Knight of Pentacles. 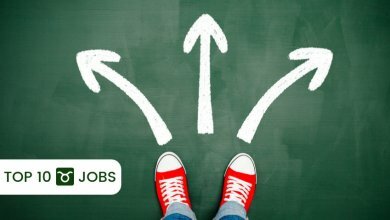 The question to ask is, “What is my quest for success; what is my next goal?” The action to consider taking: find a way to improve your value, either through professional development, increase in skills, or a new task that will challenge your ability to “get things done”. 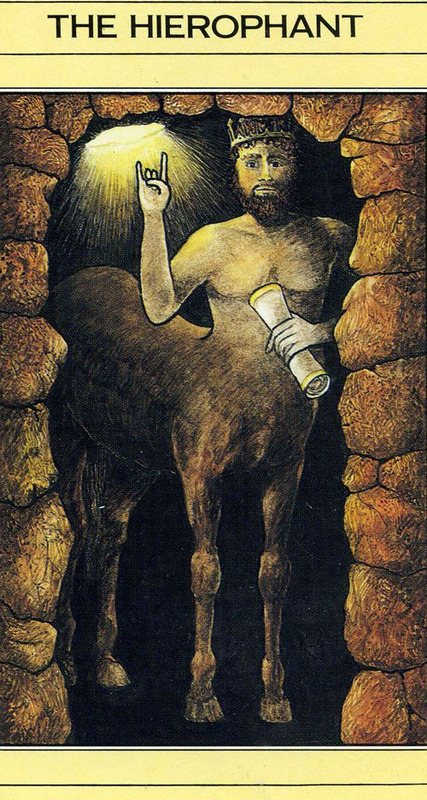 Aristaeus is the character mounted on the horse and the son of Apollo and a mortal woman. He is known for the discovery of beekeeping. Expansive Adaptable Fire fuels your Primary Drive. Your Life Path energy operates best exploring openly and trying new experiences; you must learn to map and record your knowledge to manifest your best results. Your card this month is the 8 of Wands. 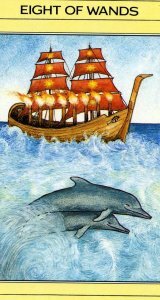 The question to ask is, “How do I appreciate my good fortune?” The action to consider taking: allow yourself to relax when the wind is at your back and the waters are flowing in your direction; consider a vacation, long or short, as payment for hard work. 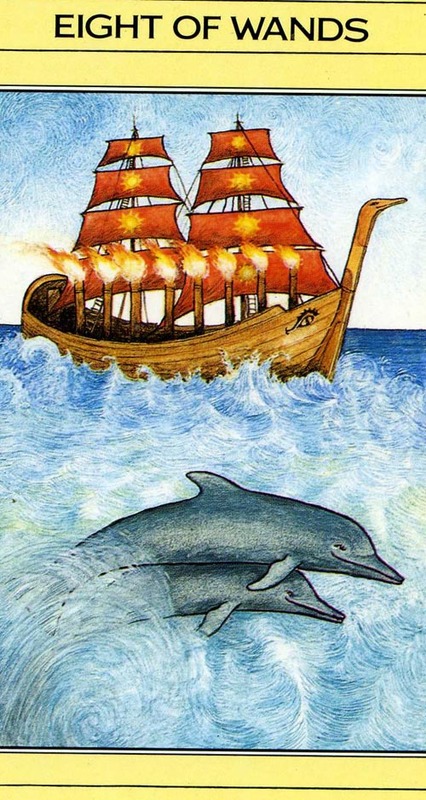 The wands tell the story of Jason and Argonauts; he has succeeded in retrieving the Golden Fleece and is enjoying fair weather on the voyage home. Ambitious Active Earth fuels your Primary Drive. Your Life Path energy operates best when you are setting and achieving goals; you must learn compassion to manifest your best results. Your card this month is the Queen of Cups. 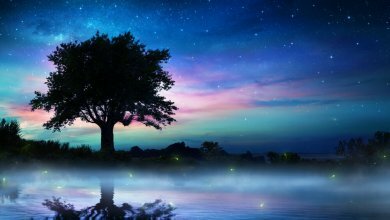 The question to ask is, “What are my deepest desires; what do I need emotionally at this time?” The action to consider taking: meditation, dream work, shamanic healing, past life regression, or psychotherapy. Helen of Troy sits on this throne, the daughter of Zeus and Leda, and the most beautiful woman in the world, whose very beauty caused men of great nations to sacrifice others to possess her. Unconventional Stable Air fuels your Primary Drive. Your Life Path energy operates best when you are authentic and unrepentant; you must learn quiet fortitude to manifest your best results. 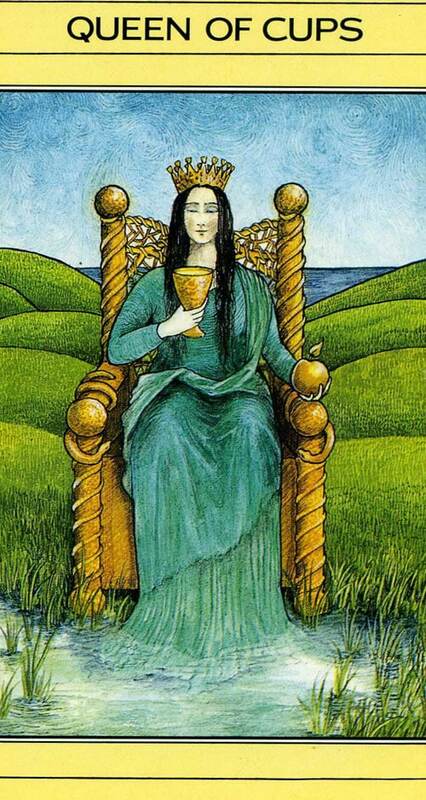 Your card this month is the 3 of Cups. The question to ask is, “How strong is my faith?” The action to consider taking: trust in spirit and wait for the outcomes to present themselves; we must have hope when dealing with the unknown. In this scene, Psyche is to be sacrificed and Eros has been sent to kill her. He falls in love with her and steals her away; unbeknownst to her, her executioner becomes her savior. Imaginative Adaptable Water fuels your Primary Drive. 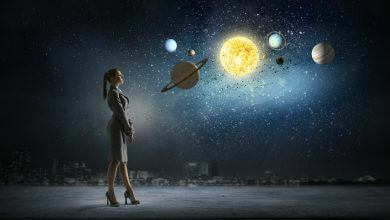 Your Life Path energy operates best connecting with others emotionally; you must learn toughness to manifest your best results. 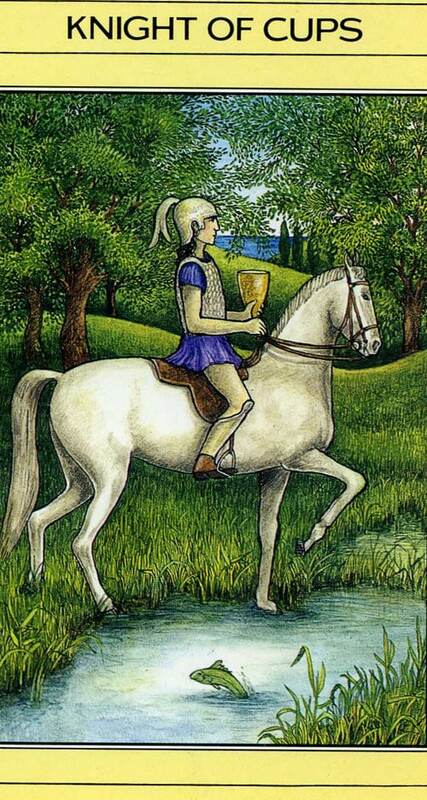 Your card this month is the Knight of Cups. 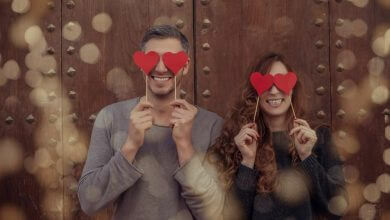 The question to ask is, “What is the quest of my heart at this time, either in a person or a purpose?” The action to consider taking: take steps to win the heart of someone you love or seek the purpose you most enjoy and want because it will bring you happiness. Perseus rides this horse, a son of Zeus and a mortal woman, who slew Medusa, and rescued Andromeda from a sea monster (and married her). He is a romantic hero. What Zodiac Sign is the Easiest to Fall in Love With?